Save by combining your accommodations and airfares. Expedia has some epic Belfast holiday packages that'll save time and give you more cash to spend! Up to 16%* can be saved when you arrange your package deal on Expedia. Click through our intercontinental database of more than 400 airline partners and 321,000 worldwide properties. Too many to select from? Don't stress — we'll help you decide! Not sure about your booking? There are no hidden fees from us if you change your mind for almost any reservation. It can be really nice to just stroll around the streets when you're in a new destination, but sometimes it's a good idea to have a plan in place. Grab your travel programme — we have lots of cool ideas for your upcoming Belfast holiday. You'll find yourself surrounded by significant sights, like the Grand Opera House and the Titanic Belfast. If you're longing to make the most of your time here, also consider visiting Belfast Castle and the Ulster Museum. Sure, listening to music on the radio is fun, but it'll never beat the exhilaration of watching an incredible live performance! So why not catch a concert at Ulster Hall? Adventurers in this destination have heaps of options. Have a look at the events guide at Waterfront Hall for an abundance of wonderful productions. Still got some time on your hands? Bring your favourite read, find a quiet spot and soak up the enticing garden fragrances at Belfast Botanic Gardens. Holidaying is about so much more than just visiting different places. It's all about the things you can do while you're away! Got a little time on your side? Make your way to our Belfast things to do page for a full range of options. Lock in a place to spend your nights before you start organising all your exciting adventures in Belfast. Select from the national capital's 65 Expedia properties and you'll be one step closer to your next luxury getaway or cheap holiday. If the idea of a generously stocked minibar and a sunken bathtub sounds good to you, grab a glass of Champagne and immerse yourself in luxury at The Merchant Hotel (16 Skipper Street) or the Malmaison Belfast (34-38 Victoria Street). If you've crunched the numbers and these don't suit your budget, don't worry — we have some lower-cost options. Take a look at the Windermere Guest House (60 Wellington Park) and the ETAP Belfast (35 Dublin Road). Get through security, shuffle onboard, take your seat and get comfortable! Your trip to Belfast is only a plane ride away. After the wheels touch down at George Best Belfast City Airport (BHD), you'll be 3 miles (5 km) from the central area. Relax amid the sculptures, monuments and plants of the garden and take a tour of the Baroque-style interior of this historic site. Arrive at the historic birthplace of the British passenger ship that sank in 1912 and learn about its tragic voyage. Attend a mesmerizing spectacle in Belfast’s creative hub, which has been at the forefront of performing arts for over a century. Few sports are as identified with just one corner of Europe as Gaelic football and hurling. Peruse works of art, gaze up at the rainbow wires that pay tribute to a murdered boy and attend a concert. Appreciate the diverse range of tropical plants in the historic greenhouses of this park and visit Northern Ireland’s largest museum. Find upscale designers, chain brands, a wide selection of restaurants and a multi-screen movie theater under one roof in lively Belfast city center. Gaze up at the famous Spire of Hope that rises from this structure’s roof and lights up the Cathedral Quarter at night. Browse the stalls selling handicrafts and food and enjoy the live entertainment at this indoor market which is among the city’s oldest attractions. An impressive Georgian building dating back to 1774, Clifton House is set in beautiful landscaped gardens. One of the most unusual and striking attractions in Belfast is the Big Fish. Admire one of Belfast’s most beautiful historic buildings, set right in the heart of the city and close to a wide variety of attractions. Stroll through the glorious meadows and hills of this park overlooking Belfast to encounter a land of castles, forts and caves. Gaze up at the formerly tilting tower that now stands corrected as an integral part of Belfast’s history and traditions. If you fancy a few rounds of golf during your Northern Ireland holiday then there are few better spots to indulge your passion than the environs of Belvoir Park. Peruse the intriguing relics dotted around the interior of this historic church and appreciate the calm oasis in Belfast’s city center. Clinging to a headland above the Irish Sea are the ruins of a medieval Irish castle. The dramatic sight offers a great photo opportunity! This small stone temple is a great picnic location and one of the best spots on the coast for bird-watching. Tours of this historic prison will take you through the cells to the execution chamber, where you’ll have the chance to meet a ghost. With views across the city and centuries of history, this classical sandstone building is one of the most popular free attractions in Belfast. Take a scenic drive to see the rugged coastline and the dramatic contrast of the bright green pastures and the blue Irish Sea. The white “House on the Hill” is the home of the Northern Ireland Assembly and a triumphant symbol of this once divided U.K. country. This dramatic rock formation was created by volcanic activity millions of years ago; however, the locals might tell you otherwise. Head to the north coast and visit the oldest operating distillery in the world to try a famous Irish whiskey. The historic house has some of the most interesting gardens in Northern Ireland and an extensive exhibition of ancient relics and artwork. One of the oldest visitor attractions in Northern Ireland, Belfast Zoo is located in the north of the city, on Antrim Road, and is home to more than 1,000 animals on its 55-acre site. Climb aboard this historic vessel, painstakingly restored to its original condition, and learn how its story overlaps with that of the famous RMS Titanic. 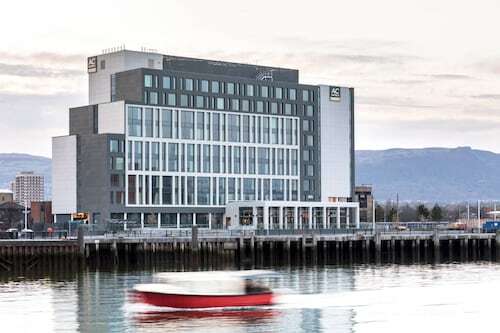 Located in the heart of Belfast, this hotel is within a 15-minute walk of Sinclair Seamen's Church, Odyssey Arena (Titanic Quarter) and Waterfront Hall. St. George's Market and Belfast City Hall are also within 15 minutes. Belfast Central Station is 16 minutes by foot. 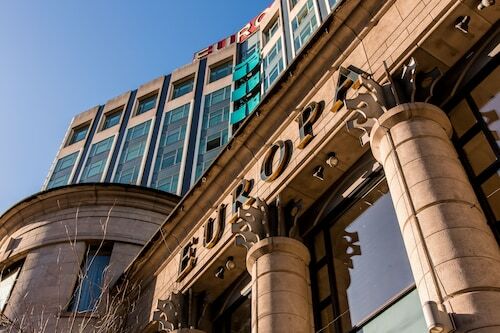 Located in Belfast City Centre, this eco-friendly hotel is within a 10-minute walk of Grand Opera House and Belfast City Hall. St. George's Market and Waterfront Hall are also within 15 minutes. Belfast Central Station is 15 minutes by foot. 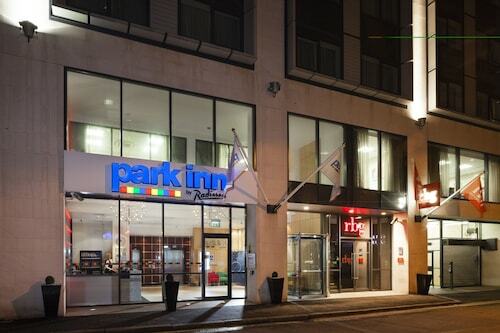 Located in Belfast City Centre, this hotel is within a 5-minute walk of Grand Opera House and Belfast City Hall. St. George's Market and Waterfront Hall are also within 15 minutes. Belfast Central Station is 13 minutes by foot. Located in Belfast City Centre, this hotel is within a 10-minute walk of Grand Opera House and Belfast City Hall. Queen's University of Belfast and St. George's Market are also within 15 minutes. Belfast Central Station is 17 minutes by foot. 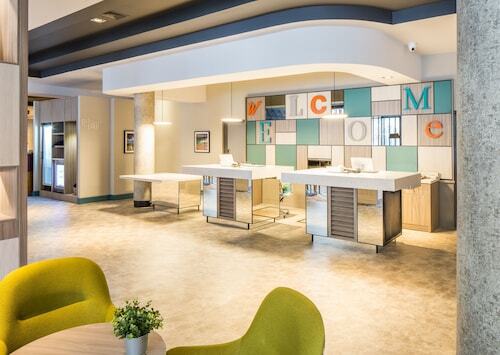 Located in Belfast City Centre, this eco-friendly hotel is within a 15-minute walk of St. Malachy's Church, St. George's Market and Waterfront Hall. Belfast City Hall and Grand Opera House are also within 1 mile (2 km). Belfast Central Station is 13 minutes by foot. 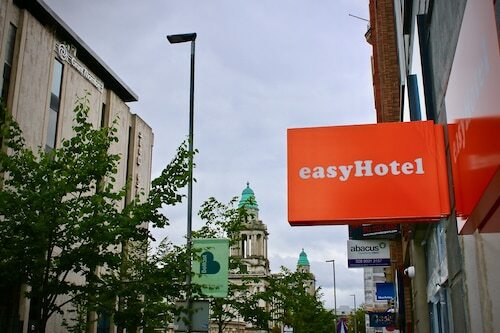 Located in Belfast City Centre, this eco-friendly hotel is within a 5-minute walk of Ulster Hall and Grand Opera House. Belfast City Hall and St. George's Market are also within 15 minutes. Belfast Central Station is 14 minutes by foot. 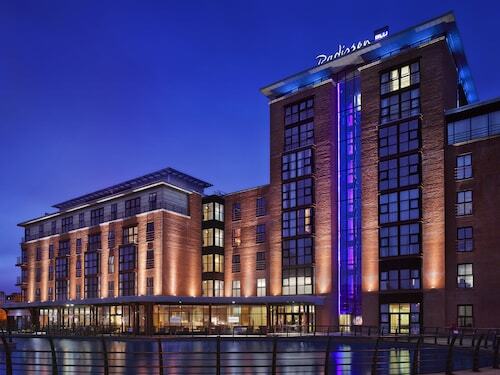 Located in Belfast City Centre, this hotel is within a 5-minute walk of Grand Opera House and Belfast City Hall. St. George's Market and Waterfront Hall are also within 15 minutes. Belfast Central Station is 14 minutes by foot. Located in Belfast City Centre, this hotel is within a 10-minute walk of Grand Opera House and Belfast City Hall. St. George's Market and Waterfront Hall are also within 15 minutes. Belfast Central Station is 15 minutes by foot.